My new book, Mindset Magic: Using Scientific & Spiritual Principles to Create Your Life, is being released in just TWO DAYS! So watch your inbox on OCTOBER 19 - I will have a very special gift for you to celebrate my new book! I'm also excited to join Best-selling Publisher and Host Linda Joy on the Inspired Conversations Radio Show on the #OMTimes network on Tuesday, OCTOBER 17 at 2pm ET. 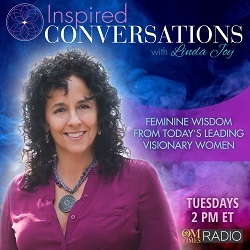 Linda's show is dedicated to bringing you intimate, authentic conversations with today's leading visionary women in personal and spiritual development, success and mindset, natural health and wellness, conscious business and self-empowerment. Remember to watch your inbox on OCTOBER 19 for your special gift to celebrate the release of my new book Mindset Magic! --> Here's to living every day like it's a day at the beach! As a life coach and hypnotist, Krysti teaches women how to connect more deeply to their inner self so they can create a life with more peace, more purpose, and more passion. If you are new to this email, "Welcome!" For more FREE Mindset tools, secrets, and articles on getting the most out of life, plus Living a Purposeful Life with Courage & Confidence preview ebook, visit www.powerful-mind.com and sign up for my newsletter. Feel free to share this newsletter with your friends and family who may benefit.